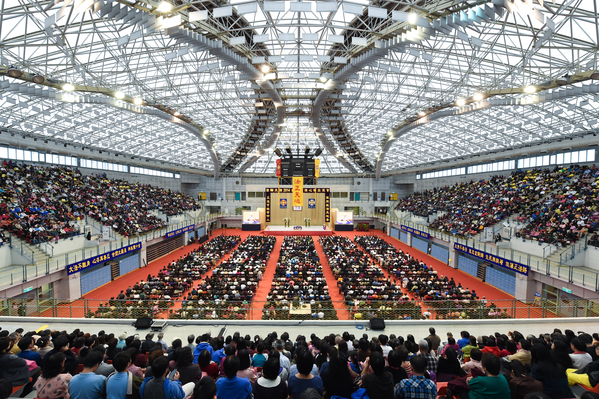 TAIPEI, Taiwan—More than 7,500 practitioners of the Chinese spiritual discipline Falun Dafa attended the 2014 Taiwan Experience Sharing Conference on Nov. 19 in Taipei, the capital city of Taiwan. Besides local practitioners in Taiwan, practitioners from Hong Kong, South Korea, Japan, Singapore, Vietnam, America, and Europe also took part in this annual event. During the conference, many practitioners spoke of their cultivation experiences while living their daily lives based on the principles of truthfulness, compassion, and forbearance. They also spoke about how they went about telling people about the ongoing persecution of people from all walks of life in China who practice Falun Dafa. Falun Dafa, also known as Falun Gong, consists of physical exercises and a moral foundation. Practitioners in China have been brutally persecuted by the Chinese regime since 1999. Shi Yanfang, a practitioner from the southern city Kaohsiung, had often contemplated the meaning of life, for she was greatly tormented by poor health as she often went to the emergency room late at night for excruciating pain caused by kidney stones in 2010. Just when poor health and the daily struggle against fame, self-interest, and emotion overwhelmed her, Shi said her life took a huge turn when she started practicing Falun Dafa in Nov. 2010. Now, Shi has a different attitude towards life—she doesn’t feel indignant over personal mistreatment, as she has understood the meaning of life. Luo Yongjie shared his experience of how he had improved his mind and body when he overcame fear and gave up his attachment to personal fame while promoting Shen Yun Performing Arts in Taiwan. Shen Yun is a non-profit company based in New York that has traveled to over 20 countries and 100 cities since it embarked on world tour beginning in 2006, with a mission to revive traditional Chinese culture. “I had thought of myself as a good person. And I had badly wanted to uphold this reputation,” said Luo, in commenting in how he had overcome the fear of being rejected while he was promoting Shen Yun at a local banquet. Fan recalled once how, when she was doing the exercises at the tourist site, mainland Chinese tourists commented how pleasant to the ears the music of the exercises was, and asked her to turn up the volume. About 15 to 16 mainland Chinese people quitt the Chinese communist party (CCP) after Fan clarified the facts to them. Quitting the party, also known as “Tuidang,” is a movement that started in 2004, and has inspired over 180 million Chinese to renounce their ties to CCP and its affiliates with public or online statements. Huang Shuru said she had been a regular participant, since April 2013, in parades in Hong Kong to raise awareness of the persecution of Falun Gong in China. While in Hong Kong, Huang said she distributed the Hong Kong edition of the Chinese-language Epoch Times to mainland Chinese. And from seeing their eyes, Huang said the mainland Chinese all had the desire to know information that is readily available to people outside China. Information is tightly censored in China and measures are in place by the Chinese regime to stymie press freedom. Huang said she encouraged Chinese tourists to pick up the newspaper by telling them that Hong Kong is a free society, and many people like her from Taiwan traveled to Hong Kong on weekends and national holidays, with the hope that mainland Chinese will not be fooled by the Chinese propaganda. Zhang Jiazhen, a retired elementary school teacher from southern central Taiwan’s Yunlin County, shared how she managed to steady her heart while working as a tour guide at a local display of the Art of Truth, Compassion, Tolerance International Exhibition. At the conclusion of the art exhibition, Zhang said that many residents at the local township had wanted to learn Falun Gong, and a nine-day class was held for them to learn how to cultivate themselves according to the practice.